Athenry defeated Renvyle in the Junior Football Championship at Oughterard on Sunday by one goal, five points to one goal, one point. There was some spectacular play, the game affording plenty of thrills for the spectators. The Athenry players proved themselves a better trained team, and by some wonderfully good passes showed marked superiority in the technique of the game. On the other hand, the Renvyle team displayed plenty of dash and showed wonderful staying power against a better trained team. With plenty of practice, they will undoubtedly prove a formidable team in the near future. 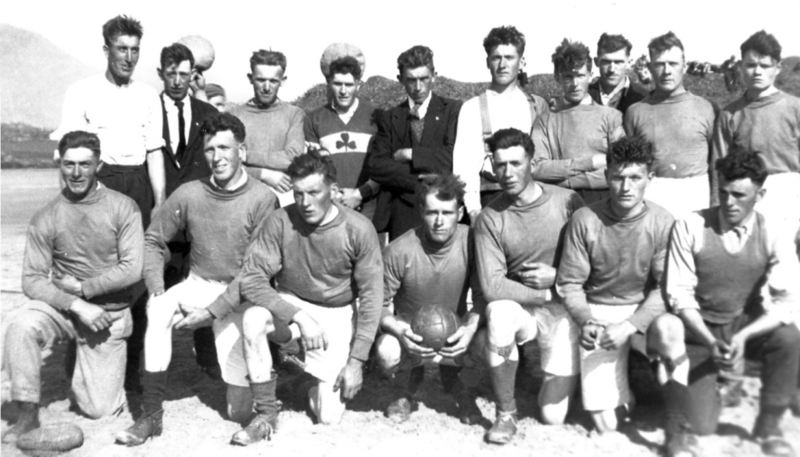 Lettergesh 1938: Back Row (L to R): Patrick Coyne, Patrick Gibbons, Martin Kane, Martin Kerrigan, Thomas Conroy, Dan Coyne, Patrick Kane, Patrick Kerrigan, Tom Coyne and Pat Kelly. Front Row (L to R): Petie O’Malley, Peter Faherty, Johnny Walsh, Patrick Mc-Donnell, Peter Coyne, John Coyne (Tom) and Michael Gibbons. Athenry won the toss, and had the advantage of a strong wind for the first half of play. Renvyle got possession of the leather and forced the ball up against the Athenry goal, narrowly missing a score. Play was reversed, and by a few clever passes Renvyle’s goal seemed in danger for the first time and inside ten minutes Athenry had registered a point (per T Glynn). Play for the greater part of the first half was in Renvyle’s territory. A free for Athenry registered another point. A foul resulted in a free for Renvyle, but the ball was forced back again into Renvyle’s goalmouth. A free for Athenry at a dangerous angle was well saved by Renvyle’s goalkeeper (T Heanue), who proved his skill more than once against Athenry’s formidable attacks which were aided by a strong wind. At this stage, one of Renvyle’s best players (Wallace) was knocked out by a blow of the ball at close range in the stomach. He was replaced by another player, and when play was resumed, another point was soon scored by Athenry. Renvyle now assumed a defensive attitude, and another free for Athenry was saved in brilliant fashion. Renvyle forced the ball back again to Athenry’s goal and it now looked as if a score would be registered but this was frustrated by Athenry’s capable goalkeeper (Egan). Two further points in quick succession for Athenry wound up half time, the score being Athenry five points, Renvyle nil. When play was resumed, Renvyle led a strong attack assailing Athenry’s goal and within a few minutes Renvyle scored a goal (per Salmon). Athenry retaliated, perhaps incensed by Renvyle’s dash and also forced a goal (per D Monahan). A well directed shot by Renvyle was saved once again by Athenry’s goalkeeper, and by the look of things, it appeared as though Renvyle was striving to equalise, a point being registered (per Fitzpatrick). A further assault by Renvyle placed Athenry’s goal in danger, and a well-directed kick by Salmon (Renvyle) was saved in spectacular fashion by Egan. Renvyle, although pressing a strong offensive to the end was unable to add to its score and the final whistle found Athenry victorious. Players in Athenry’s team, showing conspicuous ability were Michael Walsh, Martin Glynn, T Glynn, D Monahan, John Farrell, N Kilkelly and P Kilkelly. Players of outstanding merit for Renvyle were M Fitzpatrick, S Salmon, Patrick Walsh and John Gannon. Athenry: Leo Egan (goal), M L Walsh, M Kilkelly, Joe Mills (Captain), M Glynn, J Doherty, T Monahan, J Farrell, Martin Walsh, C Barrett, M Hall, Thomas Glynn, P Kilkelly, D Monahan, Joe Whyte. Renvyle: T Heanue (goal), M Fitzpatrick, M L Connolly, Stephen Salmon (Captain), P Wallace, John Keane, Joe Keane, M L Gibbons, John Salmon, Patrick Walsh, Martin Connolly, Patrick Flaherty, John Gannon, Martin Kerrigan. Mr S Donnellan was a capable referee. By 1933 there were fourteen teams affiliated to the West Board for the purpose of playing junior football so the committee decided to create a Western and Eastern Division within the Board’s area of jurisdiction. The following seven teams constituted the Western division: Clifden, Renvyle, Moycullen, Letterfrack, Knock, Carna and Killannin. This division was subsequently divided into two sections based on geographical location. Not surprisingly, Letterfrack, Carna, Clifden and Renvyle were all put into one section.